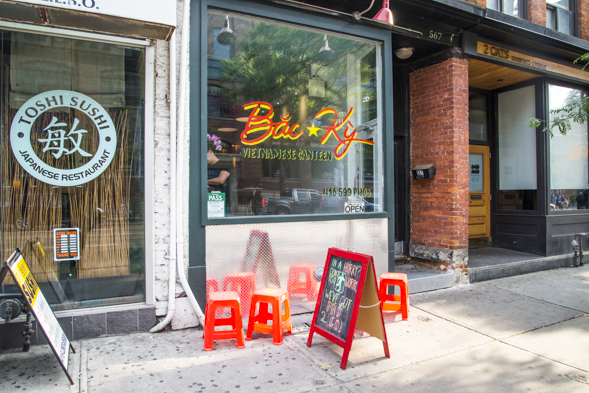 Bac Ky is a Vietnamese canteen/health bar on King West , taking over the space formerly occupied by short-lived The Greek . 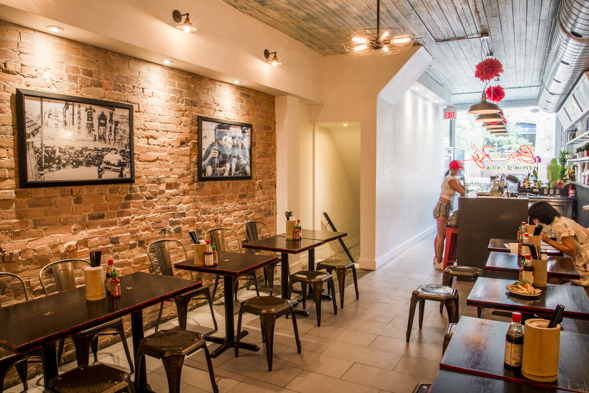 Its name is a derogatory term for people from northern Vietnam, and here the restaurant's brother-and-sister owners reclaim it to pay tribute to their parents, who came to Canada from Haiphong, a Vietnamese city in the north. restaurant-owning seems to run in the family; their parents used to have a Chinese eatery (the Hongs are ethnically Chinese) in Peterborough - the plates used here are mementos from that resto. 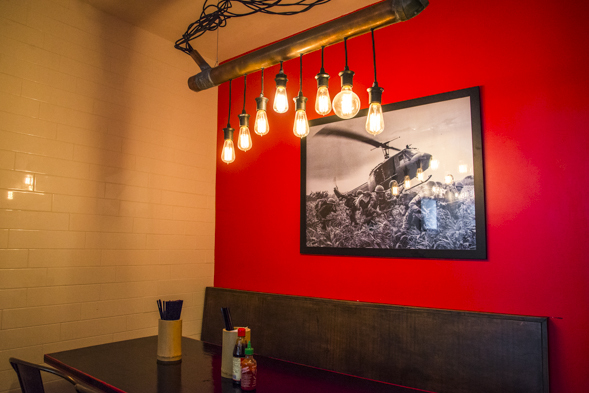 This spot is outfitted with industrial-cool decor accompanied by a soundtrack of hip-hop and R&B; the ceiling is covered in wood slats, an electric fan has been converted into lights, Edison bulbs hang in the back and an exposed brick wall features old black-and-white photos of wartime Vietnam. 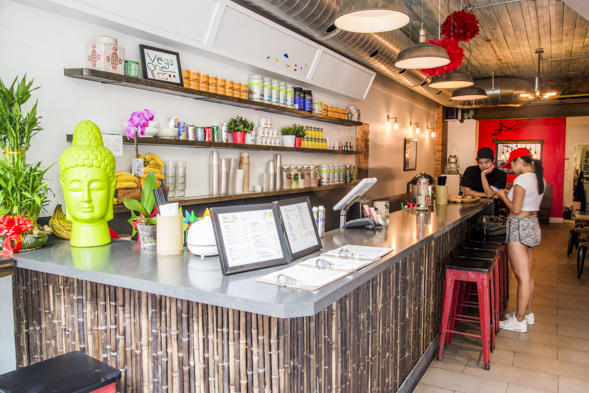 Hong professes to be a health nut, so 16oz smoothies ($6.20 each) are available here in addition to the more typical avocado or jackfruit shake ($5.49 each), or Vietnamese coffee ($3.20). I'm told a popular choice is the Mango Matcha Green Tea smoothie, which contains mango, OJ, matcha green tea extract and unsweetened almond milk. There are also $1-$2 add-ons like flax seeds, vegan protein or quinoa flakes. 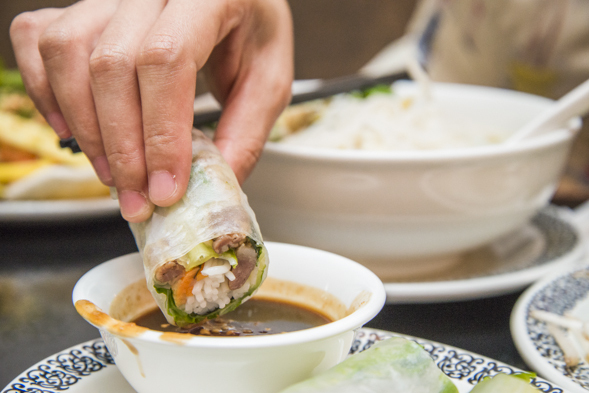 Classics like rolls, pho (rice noodle soup), bun (vermicelli) and com (rice) can be found here, with a few basic options for each. Everything is priced under $10, which is rare for this area, although not unusual for Vietnamese food. Gluten-free, veggie and vegan items are clearly labelled on the menu. 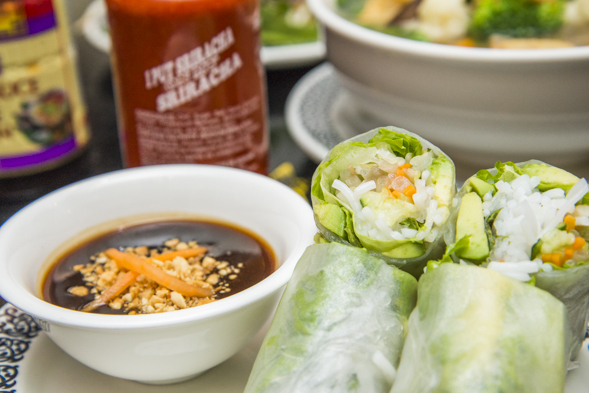 We try the veggie-friendly avocado fresh rolls ($4.70) that are served with a sweet hoisin peanut sauce. 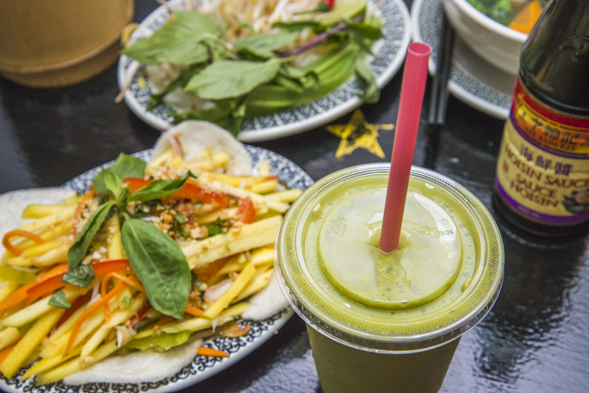 They're refreshing and crisp with mint leaves, lettuce, bean sprouts and carrots in them along with avocado and vermicelli all wrapped in rice paper. 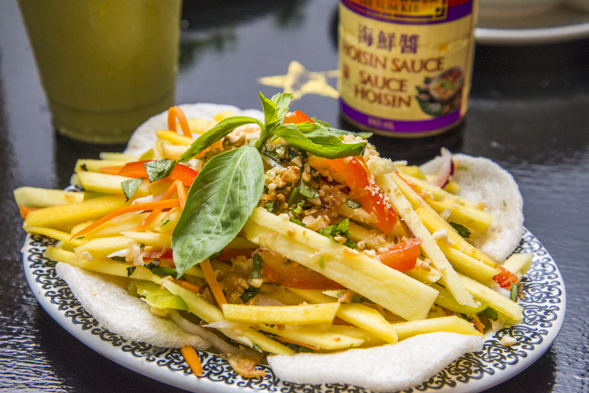 A colourful mango salad ($6) contains slices of mango, bell peppers, carrots and crushed peanuts, and its fish sauce dressing gives it a bit of zing. The shrimp chips/prawn crackers on the edges bring back memories of my childhood; I haven't eaten those things for years, although I'm not sure why I stopped. Bun served salad-style is geared towards warmer weather, so now that it's getting cooler, we're more in the mood for a bowl of pho (small $7, large $9). Hong tried to adjust the pho recipes to make them healthier, cutting down the amount of fat and sugar, and using cane sugar instead. It's nice for vegetarians to have a veggie pho option since most places only make broth with beef and/or chicken stock (which they also have here). This one uses a light and clear mushroom broth, and comes with a good amount of noodles topped with a variety of vegetables that include broccoli, cauliflower, tofu, bok choy and mushrooms. Perhaps because it's been modified to be healthier, the broth doesn't have as much depth of flavour as some other pho places, but it'll have to do if you're vegetarian and unwilling to travel further from this area. Open for lunch and dinner (but closed on Sundays), this is pretty much the only Vietnamese joint in the area if you've got a hankering for some affordable ethnic eats.